Need to Deep Clean Your Home? This 6-Step Checklist Is For You! Springtime doesn’t have to be the only time in the year that you should deep clean your home. In fact, it’s best to do it twice a year help reduce allergens, minimize clutter, and turn your home into a real haven. You’ve probably seen several deep-cleaning checklists that advise you to go from room to room. We’re going to show you a different way of cleaning – top-to-bottom cleaning. This type of cleaning is advantageous in that the dust and grime that is present in the rooms won’t float back up to the top or drift into other rooms. It might take a day or two to complete this list in this fashion, but we assure you that it’s worth it! Follow the list below to make sure that your home is clean for the upcoming change of season! Step 1: Pre-Clean – The purpose of pre-cleaning is to clear the surfaces of clutter and misplaced items. After all, you can’t clean a surface if it has junk littered all over it! A good way to get started with all the clutter is to designate a basket or each family member. Go room by room, picking up misplaced items and putting them in the appropriate basket. After the clutter is all placed in the right baskets, give them to the proper person and have them put their things away. 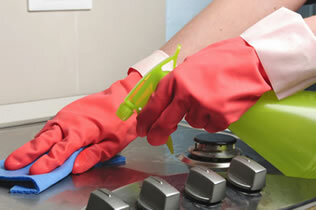 Additionally, wash and put away dishes and clear and wipe down the kitchen counters. You will be cleaning the kitchen at the end of this list, by the way! *Thoroughly dust pictures, mirrors, clocks, and other wall hangings. Step 6: The Kitchen – The end is in sight! All you have to do is tackle the kitchen, and you’ll have an immaculate home from top to bottom! Complete this checklist for your kitchen, and you’re done! Cleaning is a heavy-duty task, and you’ll need the right tools to get the job done. Don’t rely on flimsy, costly paper towels and other paper products; trust your cleaning tasks with U.S. Wiping! We offer several durable, reusable items to help you clean even the toughest spills and messes. Check out our supply online at www.uswiping.com or call us at (314) 421-3311 to find out more or place an order! How often do you have to go out and purchase paper napkins? More often than you’d probably like to admit? It can be frustrating to have to remember to put paper products on your grocery list when you go out or, even worse, run out of them when you need them the most. What would you say if we told you that you don’t have to worry about that anymore? With cloth napkins and towels, you can save time, money, and frustration with all of your household needs. Here are 4 smart reasons why you should ditch the paper towels for good and start using cloth napkins and towels in your household! They’re More Cost-Effective – Cloth napkins that are sustainably-made will cost you less than buying paper napkins over the course of time. Instead of wasting money on buying paper napkins over and over again throughout the years, you can choose cloth napkins. It might cost more upfront, but instead of throwing them away, you just have to wash the napkins when they get dirty instead of throwing them away. They’re More Durable – You probably enjoyed a barbeque dish of some sort this summer, and if you did, you more than likely used a paper product to help you clean off the sticky excess off your fingers. You might not even be able to count on one hand how many napkins you went through in making your fingers sticky-free. With cloth napkins, you will only have to use one, two tops. Sure, you’ll have to throw the napkin in the laundry right after your meal, but you won’t have to worry about wasting a bunch of paper products! They Look Nicer Than Paper Napkins – We process things with our eyes, even when we’re eating. Whether it’s a packed lunch for work or a nice dinner at home, cloth napkins make your meals feel more important and help you to relax more. You’ll Produce Less Trash – Millions of pounds of trash end up in our landfills annually. This waste finds its way into our nature and our oceans and causes many problems for our wildlife. When you use cloth napkins, you will do your part in helping reduce waste. Remember, every little bit counts! Sound too challenging for you to undertake? It’s actually a simpler process than you might think! Here’s how you can begin today! Purchase Several Napkins – You won’t want to do laundry every single day, so be sure to get a good number of napkins so that you can wash them during your regular laundry schedule. Make sure that you have enough for everyone in your family for several days. Select Plain Cloth Napkins – It might be really tempting to give in and buy the cute napkins with flowers and patterns, but they won’t always be in season. It’s best to invest in plain solid colors when it comes to cloth napkins. They will stand the test of time and will be a versatile asset for you. If all else fails, choose white napkins – they go with everything! Wash Before Use – This goes without saying, but it’s still worth mentioning! Wash the cloths in cold water and dry them before you use them. Keep Them Close By – Keeping your cloth napkins in a closet upstairs far away from the kitchen is an excellent idea if you intend to never use them. Be sure to keep them close by just as you do with paper napkins. Make it easy and either dedicate a drawer in the kitchen cabinets for them or repurpose a basket to hold these napkins. Fold them neatly and place them inside the basket, making sure that it’s located in a central location. Finally, make sure everyone in your household knows where the napkins are located! 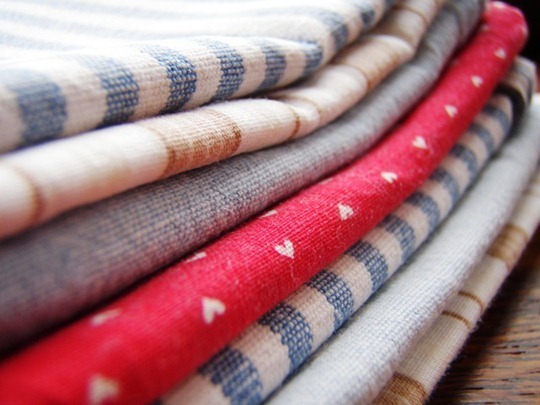 Wash Regularly – Keeping your cloth napkins clean will help them stay sanitary and look newer longer. Wash dirty cloths at least once a week. You can save time and money by washing them with other dirty towels and rags as well. Easy as that! Put Paper Towels Away For Good – If your paper towels and napkins are out of sight, they will stay out of your mind! Put them away somewhere unlikely (like that closet upstairs that we mentioned earlier). You’ll be used to using the cloth napkins in no time! If you’re looking for a smart buy, make your first stop U. S. Wiping! We have several different colors of tablecloths and napkins for you to choose from. They are made from spun polyester filament yarns and are super durable. Check them out online (http://uswiping.com/tableclothsandnapkins.aspx) or place your order at www.uswiping.com or by calling 1-800-279-2051.